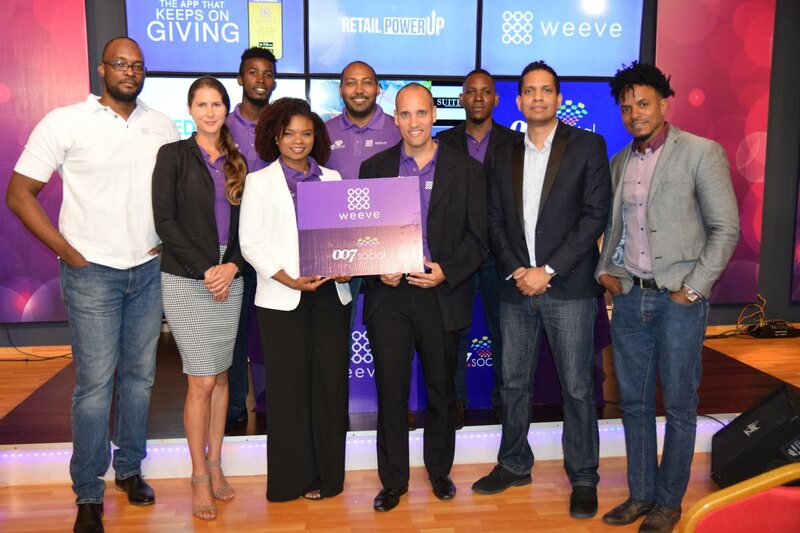 Khari Goddard (front row, from left), solutions engineer, Weeve; Gabrielle Duval, Weeve sales manager; Chrystal Martin, social strategist at 007.Social; Weeve founder Richard Marshall; Kirwin Narine, founder of 007.Social; and Dual Point System founder Marlon Grant. Standing in the back are Shaquille John, Weeve sales agent; Clint Cielto, marketing and business development; Justin Scipio, Weeve's chief performance officer; and Gabrielle Duval, client relations, Weeve. Local businesses need to be mindful of the quality of service that they deliver to their customers, founder of the digital platform weeve, Robert Marshall, said at a recent business recruitment drive. Marshall explained to business owners the importance of understanding the connection between customer experience and growing their businesses. Delivering his presentation at the company’s building on Ana Street, Woodbrook, Marshall said businesses now have the opportunity to improve the quality of their services through weeve, which has combined its digital customer engagement platform with social media and a customer reward programme. Unlike most local customer reward programmes, weeve doesn't use a physical card but an app that allows customers on its platform to reap rewards via points. These points when accumulated then allows for discounted prices when they shop at the local businesses where the points were initially awarded. The businesses on the other hand have the advantage of being able to analyse their customers through the use of the weeve platform giving them insight into who their customers are and their spending patterns. 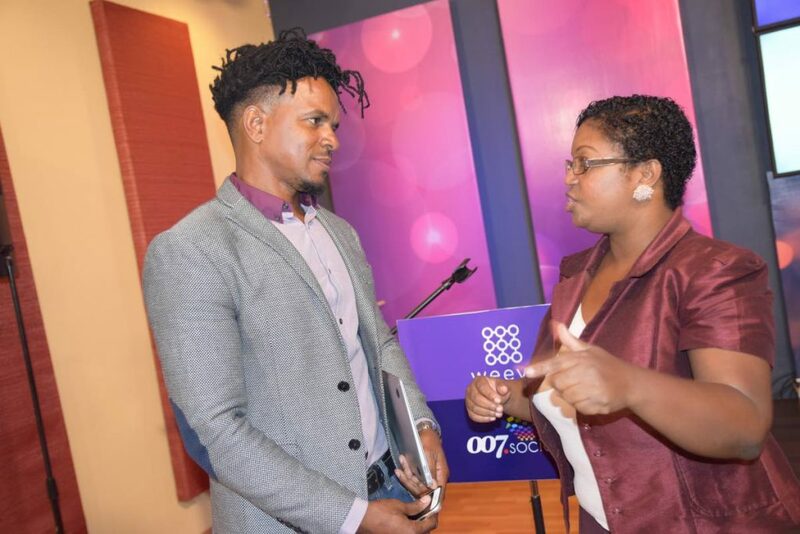 Marlon Grant, founder of Dual Point System Ltd chats with Winzy Adams of Advanced Learning Ltd.
Marshall said weeve has been in existence for three years and the company is proud to have developed a programme that is tailored to the local market. “Right now we have 58,000 users, that’s organic growth, over the three years. Essentially these users have been introduced to weeve through our weeve businesses and we’re growing at a rate of about 4,000 users a month. We have 65 locations and our target is to reach 300 locations in 2019. “Our user base to date has spent over $24 million since 2016." He said they know this because there is a ratio between the points spent and the points earned. He added that users are now spending approximately $1 million at the weeve stores. However, Marshall said he doesn’t believe in loyalty which is why weeve is based on so much more. Customer loyalty, he believes is based on the quality of service offered to customers. He said if you exceed expectations that’s where you really impress customers. This, he said, means thinking outside of the box and doing things none of your competitors are doing. He said he doesn’t believe there are loyal customers but habitual customers, when quality of experience and consistency comes together with the assistance of the weeve platform. "Weeve has many components to it: there’s the customer app, there’s a web portal and there’s a merchant app that we issue but the platform itself gives the business owner data analytics and all the information they need in order to analyse their customers and create that experience for them. "When you amplify your brand what’s your story? You must offer value by giving deals and give always, maximise your budget spend; by keeping your conversation open with existing customers." He said an example of customer engagement that offers value is the ongoing campaign with social media team 007 that offers the opportunity to win a PlayStation video game console. “It draws sometime in April and we’re giving away a Playstation 4. We had 51,000 people reached in that promotion and 4,134 posts engagements, at a cost of two cents per person on Facebook,” he said. Reply to "Weeve-ing quality service for customers"